Adventure on the crumbling brink of disaster, dodging the jaws of death with barely a pause for breath between perils. This is the world of the dauntless men and daring women of 1920s and 1930s adventure tales. Live the pulse-quickening, heart stirring, cliche-inspiring exploits chronicled in pulp magazines, movie serials, and newspaper comic strips. Visit the exotic trouble-spots of a world in peril; travel the trackless wastes of unexplored continents; soar through the wide, blue skies of the first generation of manned flight. Background material on the world of 1925-1939, including a detailed timeline of this turbulent period. Rules and guidelines for generating characters with the style and stamina for cliffhanging adventures. New hazards to be faced by the intrepid adventurer! Feel the slashing jaws of the savage piranha; thrill to the ululating war cries of the wild Tuareg; shudder at the sinister schemes of the mad scientist! 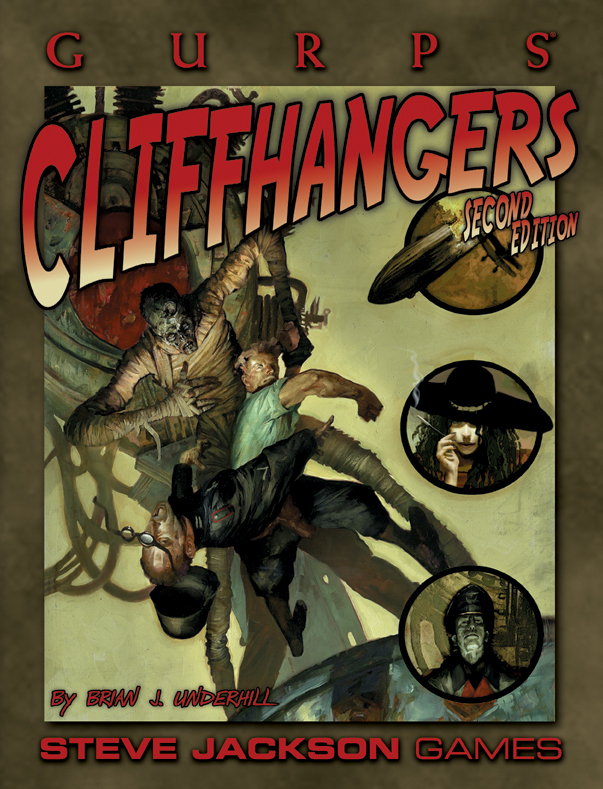 Suggestions for campaigns and adventures, and adapting the cliffhanging style to other milieus. A guide to the style, rhetoric, and fiendish cunning of pulp-era villainy. GURPS Chaos in Kansas – An adventure sourcebook for Cliffhangers. GURPS High-Tech: Pulp Guns – Descriptions, anecdotes, and stats for just about every gun made famous – or notorious – by the cops, gangsters, and mecenaries of the 20s and 30s, both in the real world and in the larger-than-life world of the pulps. GURPS Swashbucklers – Come to the age of the Swashbuckler, when the world was wide and fortunes could be made in an afternoon of smoking cannons and bloody cutlasses!